Well, that’s what one of the world’s sexiest golfers is doing – Camilo Villegas turned 27 today and he’s looking for a birthday gift from the golf gods – winning the Mercedes-Benz Championship. Although Tiger’s not in the field (nor is Phil or Jim Furyk or even Sergio), Spiderman still has his hands full trying to win the first PGA Tour event of the season with the likes of Singh and Kim in the field. But I think he can do it and I’m putting my money on the Columbian Stallion! But as is usually the case, I’m not in the majority. When I watched the Golf Channel the other night, they were predicting Vijay and AK would be the favorites. And the 10 “experts” on PGA Tour seemed to agree with them, (Mark Spoor was the only one who picked Villegas as the winner – Mark, your my man!). So I’m sticking to my guns. 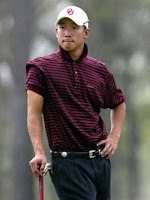 Camilo Villegas is my pick. Why you ask? Well, he’s hot in more ways than one 😉 and he ended the season with a bang with two wins and a bunch of top 5’s. He’s the 2nd highest ranked player in the field (# 7 in the world rankings) and yet he’s not expected to win, so the pressure’s off. And did I mention he’s hot? The only person in the field with a higher ranking than Camilo is Vijay. Certainly Vijay’s always a favorite, and he’s won before, but he’s had some injuries this year and we know he’s scheduled for knee surgery right after the championship – is his knee strong enough to walk those fairways? Have you ever walked the Plantation Course? It’s definitely NOT a stroll in the park. No, I don’t think Vijay will win this year. He’ll contend, but I don’t think he’ll win. Age just might catch up to him. As for Anthony Kim…he’s good – really good. But I wonder how he’ll perform in the wind? When I watched him “tee it up with Tiger” on that Nike sponsored show in the fall, I didn’t get the impression that he had a “plan” for every shot in his bag. Perhaps he was being funny, but it really surprised me to hear him say, he doesn’t really know how he hits certain shots – he just hits it. The thing that I worry about with him is the wind – he missed the cut in Houston this year (windy Texas) and didn’t play in the Sony or Valero events where wind can also be a big factor. At The Open last summer, Kim finished bogey, bogey, bogey – wind was not his friend. Now, I am not an expert on Kim and his game, but something tells me that Hawaii might come as a bit of a surprise. Anyway, for me it’s Villegas all the way! And if I can’t have him, I’ll take Els for sentimental reasons. In my opinion – AK is was over rated. I am very curious to see what he will do when Tiger returns. My pick of the week is Vijay! Hmmm…I can’t imagine him walking the hills of Kapalua with that leg. They are brutal! So my money’s still on Villegas.